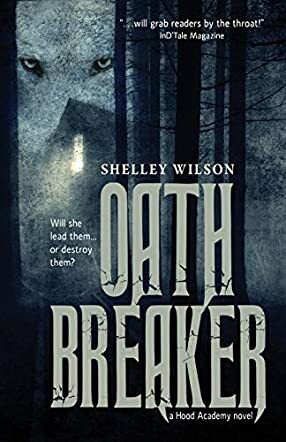 Oath Breaker by Shelley Wilson is a supernatural story about uncovering the secrets behind your past, and learning where you belong, even amongst a sea of lies. Mia had just recently lost her abusive father at the hands of a werewolf. After she is found by police, she is taken in by her uncle, Sebastian Roberts, and enrolls in Ravenshood, a school that specializes in exterminating werewolves. One day, when she gets lost in a forest near the school, she meets a boy named Cody, who helps her to get back. However, he warns her to be careful who she trusts. It isn’t long before Mia begins to see that her parents weren’t as they appeared, and that the real dangers lie within the school. In this Gothic tale, Wilson delves into the mysteries behind the war between werewolves and humans, and shows that sometimes a family legacy is better off staying buried. I liked reading about Mia. She went through the pain of being motherless, of being abused by her father, of being lied to by her uncle. Even so, she kept going. Through friends like Elizabeth and Adam, she managed to find her home at last, no matter how many heartbreaks she had to endure. I admired her compassion as well. She freed Terry, even though he was a werewolf, and had even accepted her brother, now that she'd learned more about how her mother died. Despite everything that happened, she found her home in the end. The war between werewolves and humans was incredibly interesting as well. Fueled by the wolves’ desire to be left alone, and the humans’ unquenchable hatred, the war was bred by centuries of paranoia and fear. Unfortunately, Mia’s mother and Sebastian were caught in the middle. It’s a tragic end that managed to affect the war’s entire outcome, and the reason why Mia’s story was so horrific. This book certainly gives the reader a lot to be enjoyed. From the romance that became a turning point for the war, to a young girl struggling to find her home, Wilson cultivates a Gothic novel that shows the hazy boundary between good and evil. As such, I would recommend this book to fans of the Evernight series by Elliot McKay, and Once in a Full Moon by Ellen Schreiber.